News category: Press release - published on 03 September 2018. We would like to invite you to save the date for the third ASTERICS-OBELICS workshop entitled New paths in data analysis and open data provision in Astronomy and Astroparticle Physics. This workshop will be a follow-up of the previous workshop held last year in Barcelona. Overview of the workshop: The 3rd ASTERICS – OBELICS Workshop will survey the development of new software analysis methods in Astronomy and Astroparticle Physics. Follow-up discussions about potential connections between the ESFRI projects and the implementation of EOSC will be part of the programme. Scientific programme: In this 3rd workshop we will follow up on the discussions that took place at the previous workshops. We will learn about the developments of new software analysis approaches (e.g. 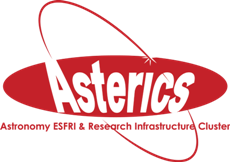 Bayesian statistics, AI and Machine Learning) in the ASTERICS partner ESFRI and other world-class research infrastructures in Astronomy, Astrophysics and Astroparticle Physics. Potential links with similar developments in other scientific domains will be explored. The European Open Science Cloud (EOSC) is going to make available series of services to the scientists. Technical and governance aspects will have impact on the research infrastructures involved in ASTERICS and on their own role in EOSC. Follow-up discussions about potential connections between the ESFRI projects and the implementation of EOSC for FAIR data and service provision will be part of the programme. The workshop will take place in Cambridge from the 23 of October to the 26 of October 2018. More information about the event and program is available on Indico.